Second IDW Ghostbusters comic mini-series in the works? Post subject: Re: IDW Tries Again? That would be awesome, too. Scott's an awesome writer, but I have no idea how much he actually knows about Ghostbusters. But Tristan is a certified fan. Certified? How do you get certified? You register and post on a Ghostbusters message board. So we're all certifiable...er, certified around here. Aw, crap. "Egon, Venkman, Ray, Winston, and some Super Special New Ghostbuster You Never Heard Of Before." It's not a good sign when the plot summary starts off like 95% of the worst of bad fanfiction. --"Female Ghostbuster? Don't we have one of those already?" Ah well, that and the plot similarities to "Tobin and the Maze of Time" aside, Scott Lobdell earns a shot. Hot but i think not nesesary . Grife, people, you don't know how weird it is to realize I'm not the most negative one here. Some of the comments on Proton Charging and GBCentral have been brutal. First and foremost, it appears that Aykroyd and Ramis are the only ones allowed to shoehorn in a Fifth Ghostbuster. Or maybe it's because she's a woman. There's time travel involved. I don't think it came from the article itself, but some of the comments around and about suggest that Rachel might be from the future or something, maybe sent to help the originals? That would be a lot better that shoving her into the current team. It's all how the character is handled. That being said, if the story opens with "Ray, Egon, Winston, Venkman, and Rachel get out of the ECTO-1", she has multiple PhDs and black belts in several martial arts, and she turns Egon into a drooling puddle of hormones the instant he lays eyes on her, I'll be right there at the front of the line to rip the piss out of it. But I'm going to wait and see what actually happens before I condemn it. Nope, it sounds like a bad idea. Seriously, stop with the new ghostbusters thing already. The only ghostbusters are: Egon, Ray, Peter, Winston, and sometimes Louis. Janine can be if she wants to. Stop adding more characters! This is not Extreme Ghostbusters! The only new Ghostbusters should be in the up and coming new movie that *Could* happen. Alright so I'm in an unusually optimistic mood and I just want to post that I really want Rachel to be John and TJ's great grand daughter. I know it will never ever happen... but I really enjoy the thought. Anyone curious to know if Rachel is a decendant of one of the guys or just some random recruit? 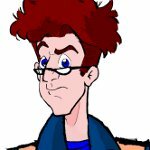 Is anyone confused by Egon being sent to the future rather than the past? That seems like the gods fatal flaw in all of this, I mean if he can be in the future with the technology to time travel he would be able to get everyone back to where they go. And I am very excited to see the Janine story, I've always wondered what she would do if she found herself alone indefinately. How would she care for the containment unit, how would she keep the building up, pay the bills, cope emotionally. I think that will be a great opportunity to get more into Janine's character. And I totally think the Egon cover looks like Nodus in green, lol. I'm kinda iffy on this concept of a fifth Ghostbuster being like "Hey kids! ITS A GIRL! Arent we original!?". As its been said, if she's from some kinda alternate future or something, that's fine, but just throwing a random girl onto the team makes no sense. I do like the concepts of Ghost Busting in different time periods. It looks like Ray has hooked up his sword to some kind of Pack, Venkman has that steam punk Pack, Egon has the whole magic suit thing going on and Winston... Well, he just looks like he's gonna Billy Badass his way through stuff with a hammer... which works for me, haha. I'm hoping that it a future member if GBI rather then a decendant of one of the guy's . They make her Egon's descendant without making it quite clear she's Janine's descendant too. Chances are tho, they wont have her be a descendant of Egon, if they do, it'll be ambiguous or Egon wont have gotten together with ANYONE at all.